Why is MediCap one of the best medical video recording program in the world? Our company was founded in 2007 and our mission is to develop software for the medical-health professionals especially for the surgeons doing endoscopic surgery. The full HD video recording, the video editing, the video call and the video broadcasting are the main interest areas of our company. We always work for the medical staff to make their life easier. 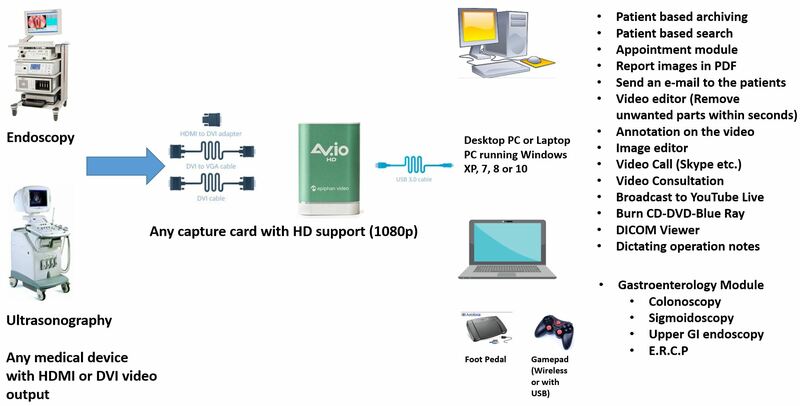 Robust video capturing (recording) software for the medical procedures especially for the endoscopic surgeries. Medical video capture (record) in full HD (1920x1080) quality. Patient based recording. Search for a patient. Quick access to the patient’s video. Make annotations on the video during recording. Draw on the video, point at a structure on the video. Incredible fast video edit. You don't have to wait for hours for the rendering the video. Edit the recorded video within seconds. Dictate your operation notes. After the surgery completes, you can dictate your operation’s notes directly within MediCap via MediCap’s audio recording module. Picture in Picture (PIP) feature. You can integrate several medical device output into one video. Edit captured images. Draw arrows, lines etc. on the image. Burn CD, DVD, Blue-Ray easily within MediCap. Foot-pedal & wireless gamepad & joystick unit (for hands free) support. Video call function. Share and consult your operations with your colleagues instantly. Broadcast your operations in YouTube Live. Compatible with Skype, Google Hangout, Vsee, Yahoo Messenger, PalTalk, OoVoo, Camfrog, iVisit, Eyeball Chat etc. Share you operations with people all around the world. Create YouTube live event and broadcast video-audio within MediCap. Compatible with lots of media stream services. RTMP stream and Window Media Servers. A sample setup for Medicap shown below. To have a look for the full features of MediCap, please click.